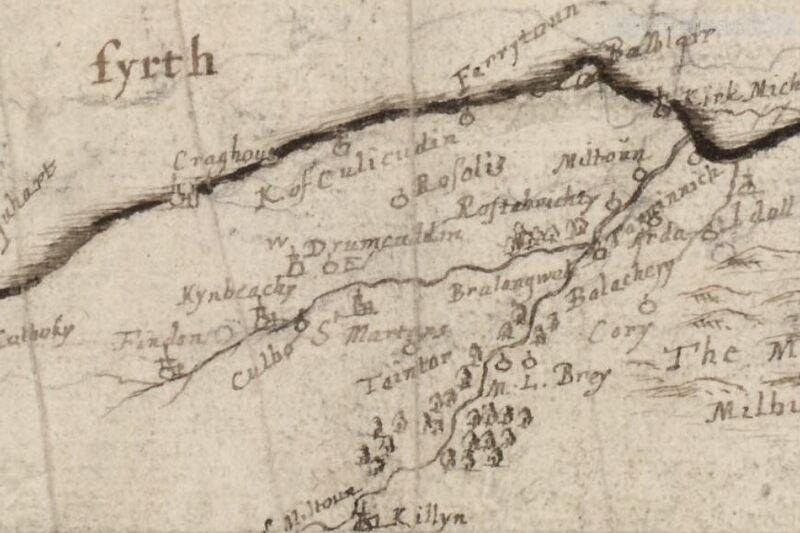 the first mention of a castle in the documents is not until 1876 on the 1st Edition map. 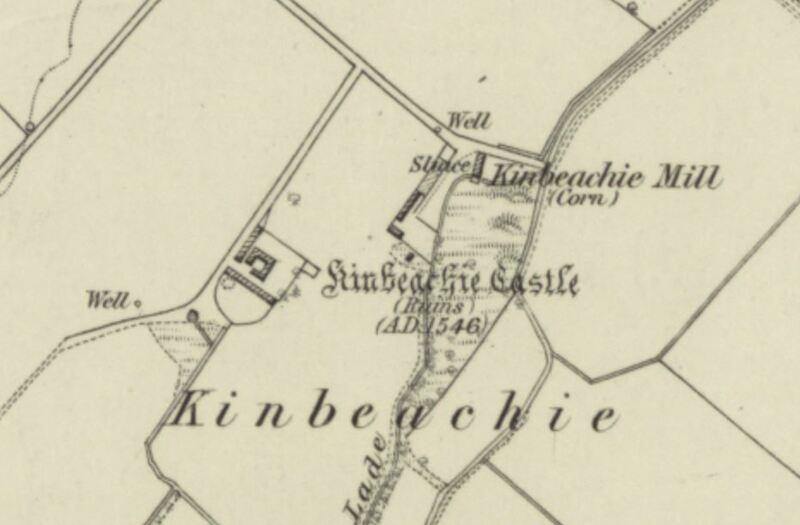 The OS Name Book has 3 local people verifying that the building was known as “Kinbeachie Castle”. 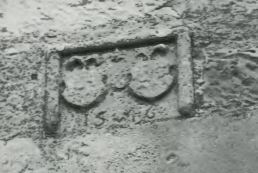 a carved stone with the date of 1546 (right and below) above a fireplace in the gable end of the lairds house on the photograph of 1959. But was the carved stone moved to Kinbeachie from elsewhere? Another stone – the magnificent Cromarty Stone (below), sometimes known as the Kinbeachie Stone, was moved here probably in 1818. 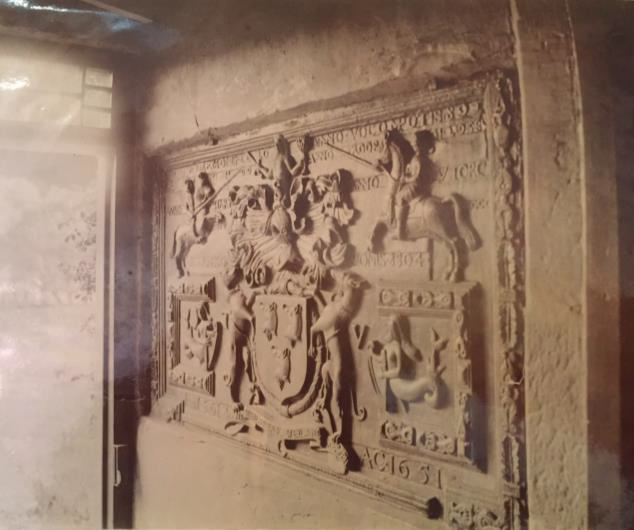 It was carved for Sir Thomas Urquhart in 1651 and originally above a fireplace in Cromarty Castle but was re-used at Kinbeachie as a chimneypiece. The stone is seen here in a pre1890 photograph most probably “in the porch of a nearby farm cottage”. The stone was later transfered to the National Museum of Scotland, Edinburgh in 1923 (Level 1 Ref H.KG96). photographs taken by the RCAHMS in 1959 show the almost complete gable of a building. The 2 storey gable with “crow steps” is typical of a lairds house. 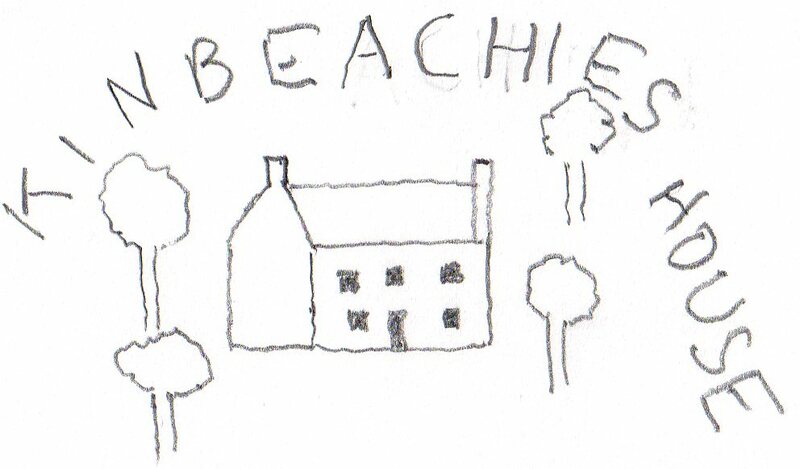 a vignette on a 1769 estate plan (below, traced from a copy of the plan in Inverness Archives) of neighbouring Findon Estate with the annotation “Kinbeachies House”. 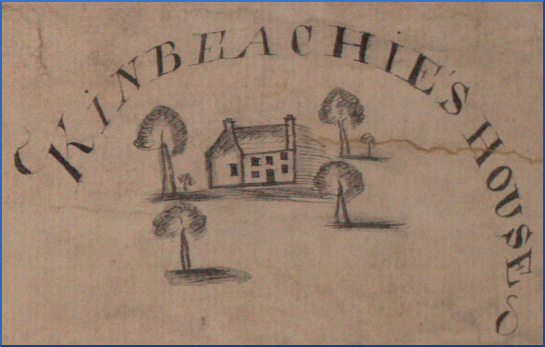 research into the family of “Urquhart of Kinbeachie” on the https://www.scotlandspeople.gov.uk/ website produced a will of Thomas Urquhart of Kinbeachie (died 1840) which included an inventory and valuation of contents of “the Dwelling House at Kinbeachie”; the house is described as having a parlour, 3 bedrooms and a kitchen with servant’s bed above, typical of a lairds house. A list of those paying window tax in the 18th century on the http://www.scotlandsplaces.gov.uk/ website included Thomas Urquhart of Kinbeachie paying for 8 windows from 1762 to 1778. 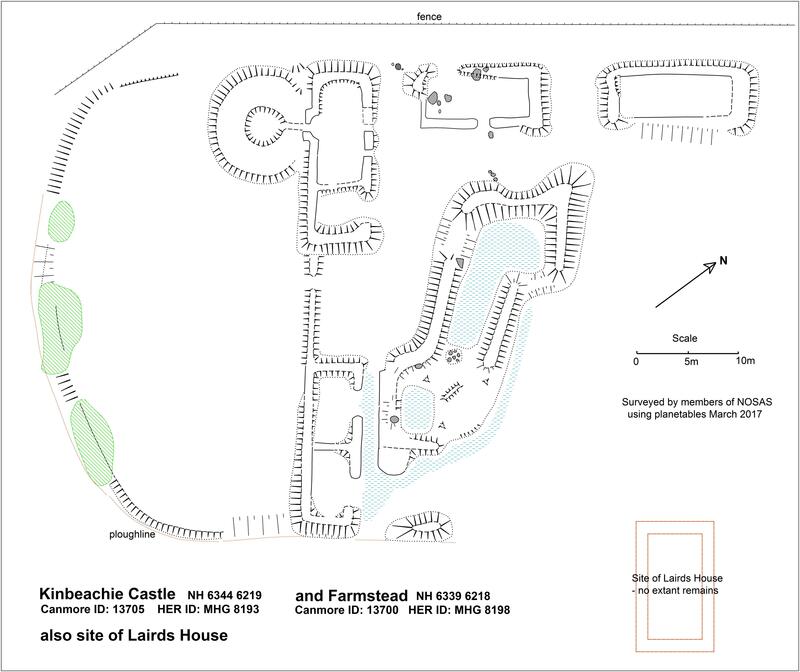 This evidence was all very convincing for a “lairds house” but where were the remains of the house? There has been significant destruction and stone robbing at the site, but after studying what remains there, and the documentary, photographic and map evidence it was possible to arrive at a reasonably confident conclusion. 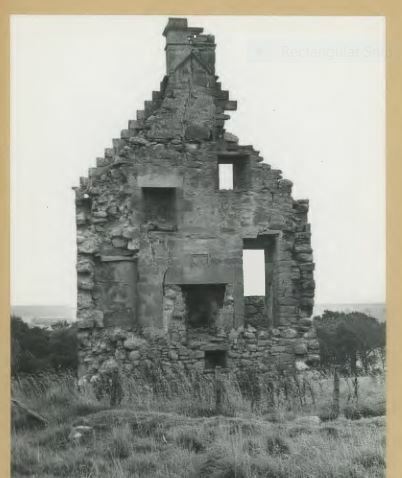 After a careful study of the surface remains at the site, the 1959 photographs and the 1st and 2nd edition OS maps we came to the conclusion that the “lairds house” was the building seen on the 1st and 2nd edition OS maps of 1876 and 1904 as a ruin to the east of the site. There are no traces of it today, the land has been ploughed over and the building has disappeared completely. 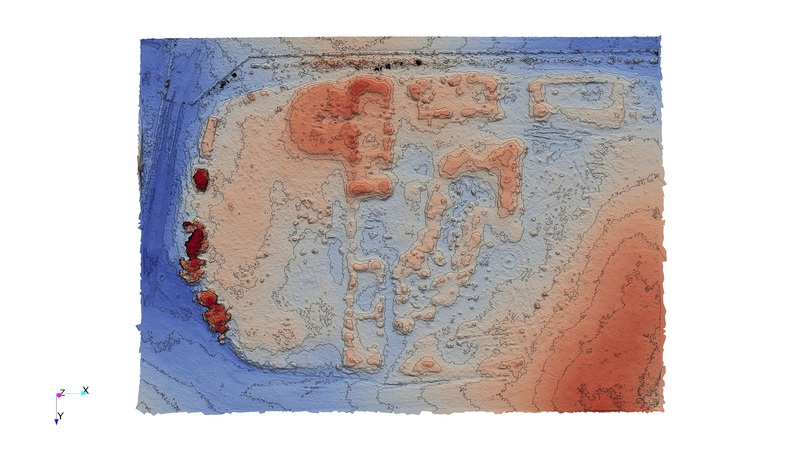 The building was on a slightly higher piece of ground; the OS maps of 1876, 1904 and 1937-60 (1:25,000) have a ruined building, but there is nothing on the current OS map. The building footings were however still extant in 1966 when the Canmore entry has “the remains of Kinbeachie Castle (ie. the Lairds House) comprise the SE wall and the foundations of the NE, NW and SW walls. The SE wall 1.2m in width is extant to a maximum height of 1.7m and total length of 6.6m externally. 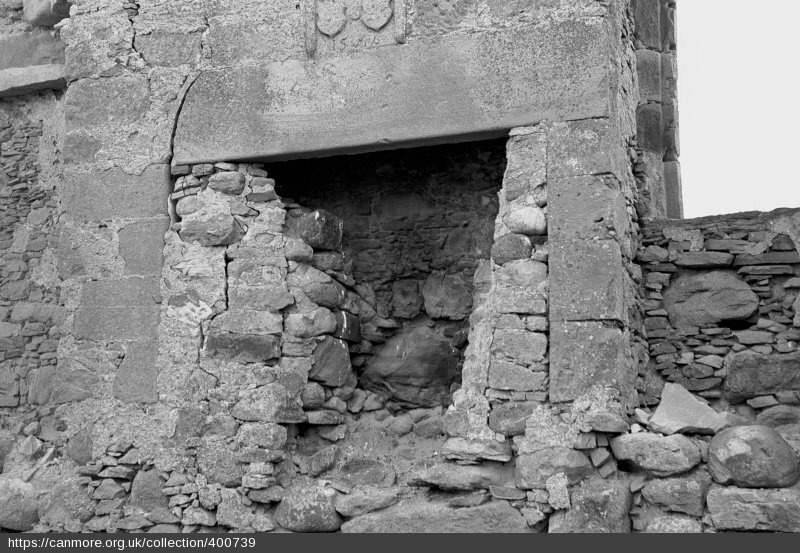 It is rubble masonry but the E and S angles have been constructed of dressed stones. The inside wall is obscured in a mass of tumble”. No such remains are seen at the site today. 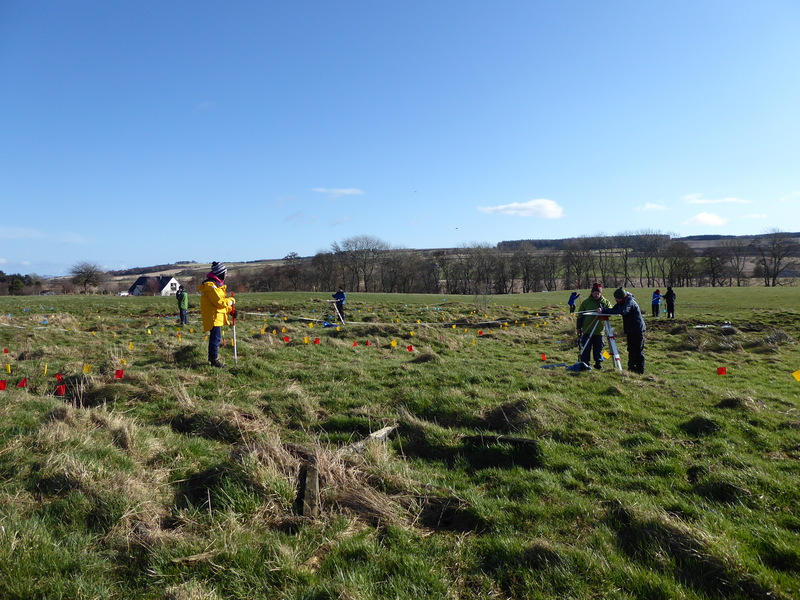 NOSAS members undertaking the planetable survey at Kinbeachie. We are left, then, with the substantial remains in the central area of the site; this surely must be what remains of the old castle, much altered and re-used as one might expect. The two walls at right-angles to one another suggest the foundations of a small medieval tower house which is circa10.5m x 7-8m. 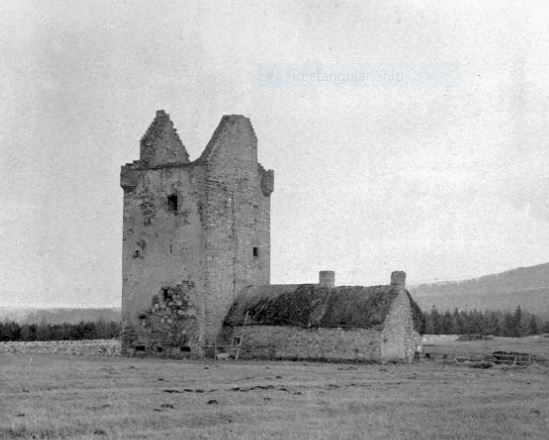 Newmore Castle, near Alness, is similar in size at 10.9m x 7.3m and has a date stone of 1625 although it is said to have existed from 1580. Fairburn Tower too has an even smaller ground plan but is 5 storeys high; it is reported as having been built in the 1540s. Fairburn Tower, photograph from 1890. It is not unreasonable to think that the old castle would have been used as a byre for animals after it had been deserted; hence the additional remains to the south of the building. So the answer to the original question “is it a castle or a lairds house?” is both! 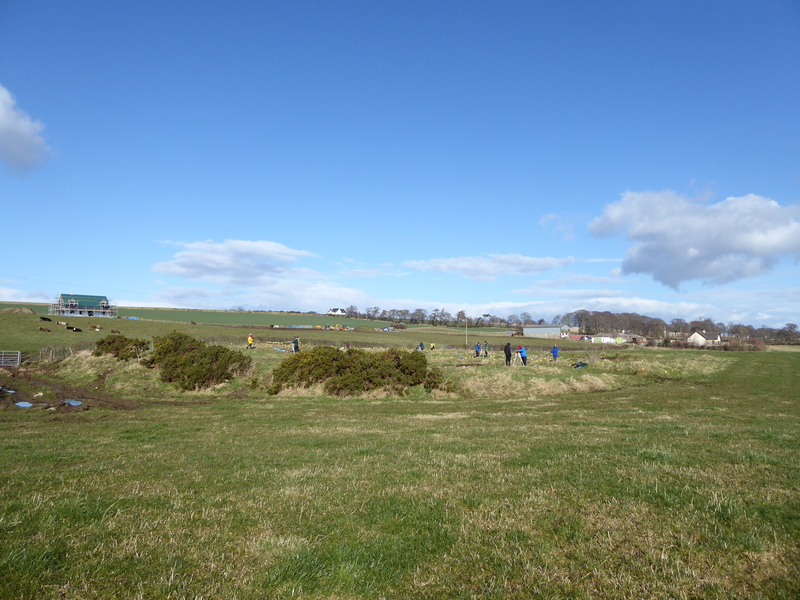 A report on the project with fuller historical background to the site and the Urquhart family of Kinbeachie has now been produced – read here. David Alston, 2006 – My Little Town of Cromarty. Of Kinbeachie Castle, formerly a seat of Urquharts, only S gable remains. It contains a fireplace over which is a panel dated 1546. The other walls are reduced to foundation level. MacDonald, Polson and Brown (1931) say that another panel, dated 1612, is now in National Portrait Gallery, Edinburgh. I believe that the sculpture Edwin James Brechin moved prior to WWI is now sitting exposed to the elements outside in the courtyard of the Museum of Edinburgh that is housed in the 16th Century house on the Royal Mile. One long piece is dated 1612 and is sitting on 2 other pieces all untitled and unnamed. 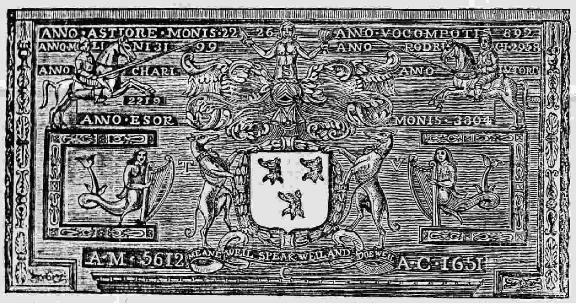 It has a coat of arms with 3 stars in the top horizontal section and in the bottom a crescent moon. In the corner there is also a carved section with a armorial design containing two stars, a crescent moon and a boar head with the motto: Constantiae Et Labore. I believe that it probably got mixed up with other local stones and people don’t realise where they originated from. I have been writing a biography of a man whose father and grandfather both married Urquhart ladies. His grandmother Elizabeth, was the daughter of William Urquhart from Craigston Castle and his mother Henrietta, daughter of William Urquhart of Meldrum and Byth. Elizabeth’s father inherited Craigston from his first cousin in 1756 and Cromarty on the death of Colonel James Urquhart (1680-1741) who died without issue although he later sold Cromarty. 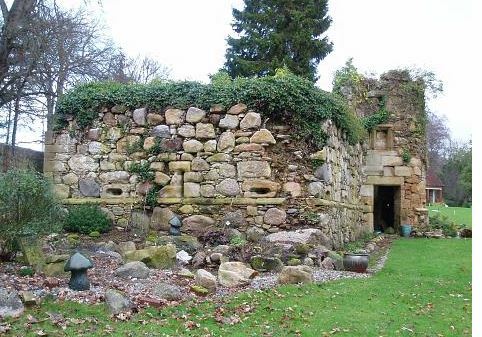 Elizabeth’s stepbrother inherited Craigston and there is a picture of the Cromarty Stone in Craigstone Castle. I can send you some photos by email if you like.